On September 17 2011, hundreds of Americans gathered in New York’s Wall Street district, the very hub of American and global capitalism. Calling themselves the Occupy Wall Street movement, they set up a protest encampment, which soon spawned similarly themed protests in over 100 US cities around the world. 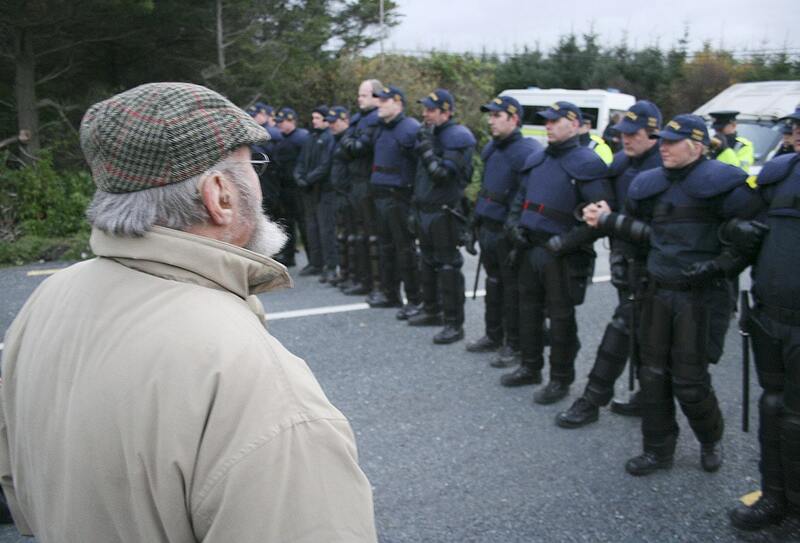 Within months, most Occupy camps around the world – including camps in Ireland – had been forcibly closed by police. In the US, over 6,000 protestors were arrested. Some were batoned or pepper-sprayed. A movement that encompassed around fifty countries was being suppressed. State power – using police power – was crushing People Power. A few weeks ago, on the day the Dáil reconvened after its lengthy summer recess, a few protest groups gathered outside the gates. 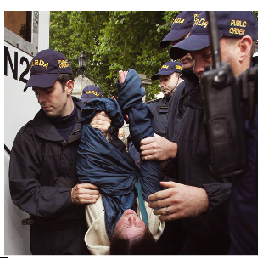 The following day’s Irish Times carried a front-page photograph of a woman being carried from the scene by five members of the Garda Public Order Unit (POU) – its riot squad. Why? Did she pose a physical threat to gardaí, to members of the public or to members of the Dáil? Rossport Residents Reflect On Resistance. 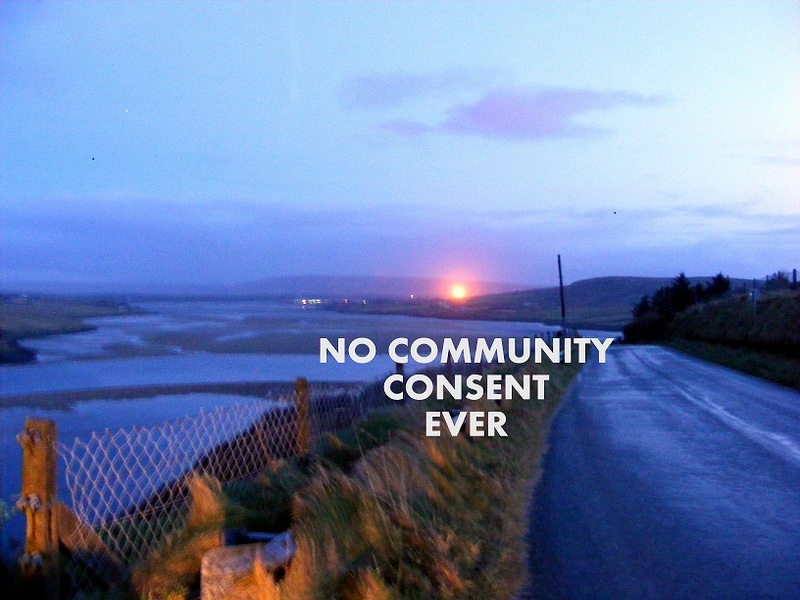 An upcoming exhibition of photography and oral testimony sets out to probe the Corrib gas dispute. It’s organised around the question “If I Could Say One Thing To Other Communities…” and features Rossport residents delivering sage like advice. Rashers Tierney previewed the panels and caught up with some of the organisers. Shell has started testing their outdated refinery in Ballinaboy. Gas for flaring is being supplied by Bord Gáis. The Corrib natural gas pipeline is unlikely to have a large downward impact on the cost of gas, Gas Networks Ireland's head of finance said. Rossport lies on Ireland's wild Atlantic coast – a beautiful, unassuming fishing village in County Mayo, it has the misfortune of resting next to the country's hidden goldmine: the Corrib Gas Field. Over more than a decade, the traditional, rural community has become synonymous with protest, as it resists the attempts of Shell to exploit fossil fuels in one of Ireland's environmentally protected areas. The company wants to extract the gas and that has meant building the longest gas pipeline tunnel in Europe and a processing plant in the picture-postcard farming area. A four-year research project (2010-2014) in the parish of Kilcommon, northwest Mayo, sought to identify and share useful knowledge from the experiences of challenging the Corrib Gas project. This has been used to create an exhibition in which people respond to the question: If you could say one thing to other communities facing an unsafe development planned for their area, what would it be?